1 May 2013 — The Fifth Estate reader Sarah-Jane Sherwood recently visited Tasmania’s Forest Walks Lodge and discovered a resort that aspires to responsible, sustainable, luxury complete with Trombe walls that absorb the sun’s heat during the day, a complex waste management system controlled by a two-metre high underground worm farm, and organic meals. But then, one of the owners, Sean Cadman, is a former president of the Forest Stewardship Council. The challenge with acting responsibly and considering the planet when we travel, or even when going about our everyday lives, is that it is expensive and the options are limited. This means we really need to search hard to do the right thing. Challenging at best in our time-poor, modern day society. For this reason I was pleasantly surprised when I searched for “eco resort Tasmania” and found the entirely sustainable, self-sufficient, Forest Walks Lodge. The Lodge is located in Jackey’s Marsh, near Deloraine, Great Western Tiers, just a one-hour drive from Launceston Airport and $180 a night for a premium room. Though planning for the Lodge began 10 years ago, this stunning property has only been open for business for three years. Designing the Lodge took two years and the building process took an incredible five years. Owners, Sean Cadman and Rosemary Norwood, told us that sourcing sustainable building materials was the biggest challenge. They had to weigh up the carbon output in production versus the carbon output of transportation. As Sean was the president of the Forestry Stewardship Council at the time, he also tried to source FSC certified timbers where possible yet, while his conscience told him to buy local, due to the excesses of the hardwood industry in Tasmania, it was only possible to use recycled Tasmanian timbers and Tasmanian softwoods in building the Lodge. The Lodge is in the middle of a valley with only farmland surrounding it and no other properties visible. There is no electricity or passing traffic and it is incredibly peaceful. We have never gazed at such amazing star constellations as those we saw on the three nights we stayed at Forest Walks Lodge. In my experience, it is comparable only to the Sahara Desert. Sean and Rosemary picked the site for all of these reasons and the fact that they wanted to use the natural environment to provide the Lodge with energy. As a result of the two years of in-depth planning, the Lodge is now entirely self-sufficient with a combination of solar energy from the roof panels and hydro energy from a turbine which is connected to a nearby stream. While $180 may be a little more than an average couple can afford to spend, and there are cheaper rooms at $140 a night, the benefits of the higher priced rooms far outweighed the cost. Our private room, at the end of the Lodge, had its own little patio overlooking a stream, which is patrolled by echidnas and the occasional platypus. We were provided with a lavish, organic breakfast each day and my gluten and dairy intolerances were well catered for. The beds were large and incredibly comfortable and we had a huge corner bath, supplied with fresh spring water. The whole Lodge in fact was supplied by the spring, which was like turning on the tap and filling up our glasses with Evian – or in this case Tallahassee Brook, the natural spring which serves the property. As well as being a former president of the FSC Sean has a number of strings to his bow – he is an excellent cook, gardener. This meant we had three nights of superb, three-course, organic meals, with vegetables sourced from the gardens (at $45 a head), and a fantastic walking guide. We jumped at the opportunity to venture out on a four-hour return walk through the forest and rainforest, to learn about how the environment was formed and how felling has changed the behaviour of the forests, stopping along the way to drink from a natural spring. It was both enchanting and educational and we were greeted, upon our return, by a lovely organic lunch provided by Rosemary. Despite being a haven of solitude and a relaxation sanctuary, there is plenty to do in the area. Chudleigh and Mole Creek are located nearby and we visited the Melita honey farm, tasting around 10 flavours of honey but being presented with more than 50 – some natural and some, such as strawberry and chocolate, aimed at the younger generations. We were mesmerised by the glass viewing pane with thousands of bees carrying pollen into the hive. We also visited 41° South, a salmon and ginseng farm, Trowunna Wildlife Park which houses the world’s largest population of Tasmanian devils, a wild deer farm and a maze with a tea garden. There are also caves, markets and wine and cheese tastings on offer. Tasmania is renowned for being chilly in the mornings and evenings and we were amazed at how warm and cosy the lodge was to return to. The stone floors are warmed by an under-floor heating system and the temperature never usually drops below 18 degrees Celsius. Even in the harshest winter of 2011, with no heating for several weeks, the temperature only dropped as low as 11c. Trombe walls, along the northern corridor absorb the sun’s heat, through the triple-glazed windows, during the day and the sand and lime render, with sand packed crevices, provides a thermal mass to the Lodge which traps the heat inside overnight. The most fascinating thing about the property for me, and one the kids will love, is the Biolytix waste management system, which is controlled by a two-metre high, underground worm farm which processes black and grey waste and delivers it back, in the form of clean water, to a nutrient rich irrigation bed above the house. 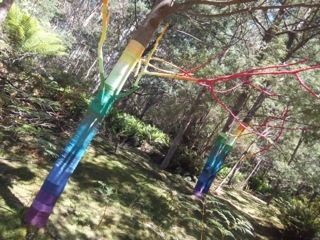 Perhaps the more squeamish should give the worm farm a miss and continue instead to the fairy trees on the hill beyond the Lodge. Utterly mesmerising and a perfect place for a picnic or a wallaby spotting opportunity! The full Fifth Estate article can be viewed here.